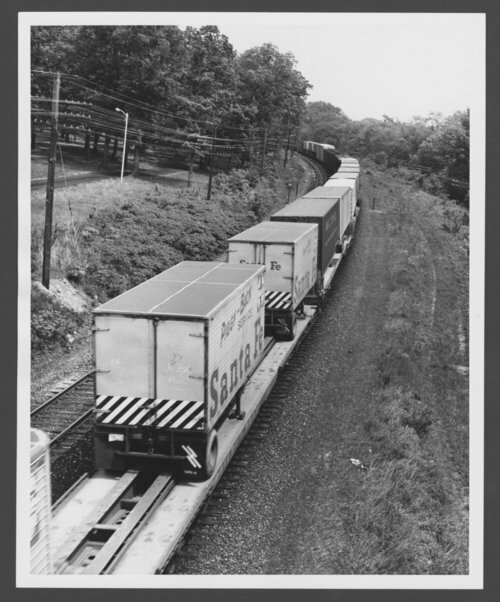 This black and white photograph shows a fleet of Atchison, Topeka & Santa Fe Railway Company's truck trailers on flatcars near Willow Springs, Illinois. These trailers on flatcars, (TOFC), are commonly referred to as a piggy-back service. With this intermodal form of transportation, between the railroad and trucking services, freight can be delivered in half of the time.